Delivering the authentic record series of the comicss "Pyocotan" that are the cult that is active in magazine "game labo", "Takeshi Boy" and "Niconico Broadcasting" in full color! This time, it was collected three of them from "Red cluck juice", "get a laser", "game the Great appears!" and "the father of the dove" in total. 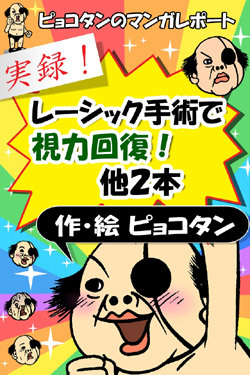 A title product "gets a laser" is the operation of the eyes of the now topic, the authentic record comics of the LASIK operation. If eyesight is restored by a laser surgery, he is suggested that it let you write it to like chief editor comment of the magazine "Game Labo"….